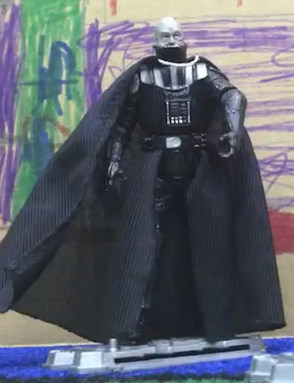 It seems that our video for the new K1s wasn't our last class project! The children had painted pebbles into characters as a part of our unit on How We Express Ourselves. When everyone was done, we each introduced our character to the class and described him/her/it. 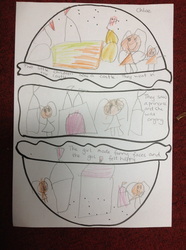 As each child went along, they started making connections between the characters. Suddenly families were being formed, pets adopted and friendships occurring! For instance, there were three children who created different types of monsters and they decided that they were a monster family all living in the same house with a pet dragon, which was created by another child. Magical flowers became homes to two butterfly fairies and other mystical creatures all resided in a forest together (including a flying car!). 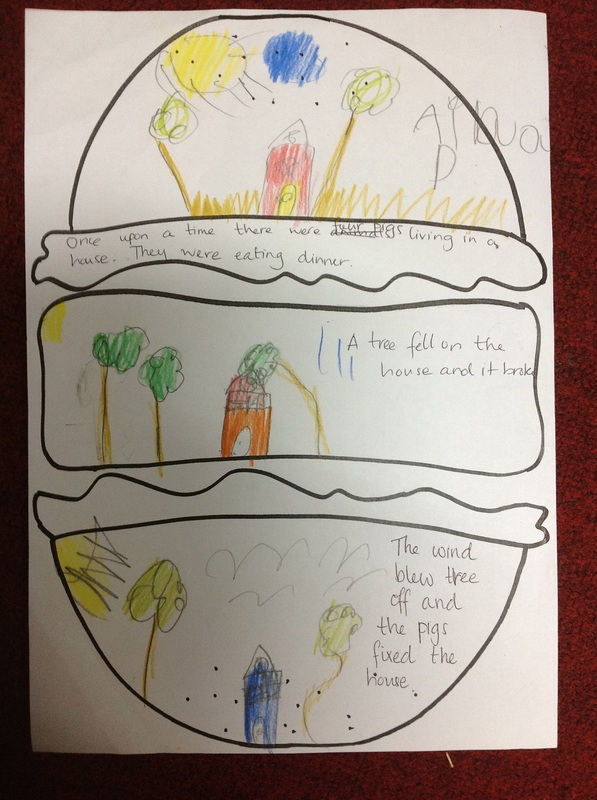 Today the children finally got to fully develop the plot together. Normally they are used to the simple hamburger structure: Introduction, Problem, Solution. However, this time, we had so many characters that the story couldn't be that simple or many would not be included. 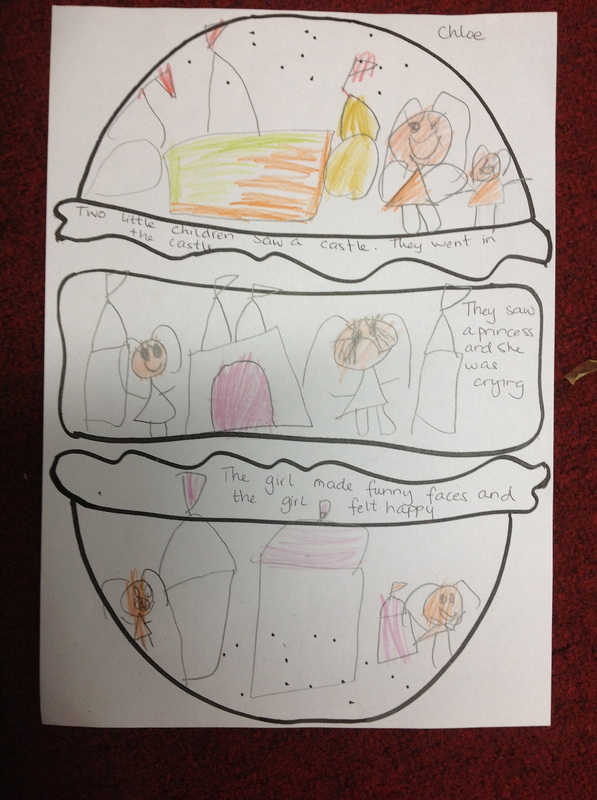 Through this discussion the children discovered that a story can actually have many problems, in fact, it can make the story more interesting. They planned out how the story should be told and what each character should say at each part. When we were done we all gave ourselves a big clap for working so well together, and I thought we were done...but then I heard, "Miss Pana! 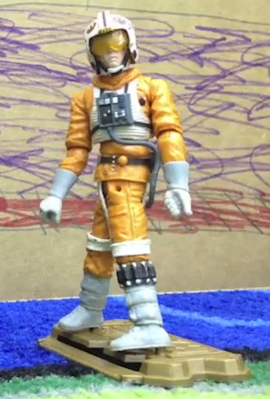 VIDEO!!!" This was followed by, "YEA, and put it on the blog!" I was nominated to be the storyteller because I didn't have my own pebble character, but believe me I was TOLD what to say! 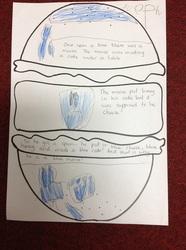 :) I recorded the story in short clips on the iPad then pieced them together using the app Explain Everything. This whole process became another piece of authentic assessment for me, showing me how much they have learned about stories, collaboration, perspective, and story organization. Great job guys! I am so proud of you for coming up with this and all on your own! A Pebble Story from Pana Asavavatana on Vimeo. With just three more days left of school, K1PA has completed our final project together: a class video teaching the new K1s all about what it's like to be in K1! We are all experts now after all! The kids each thought of something they wanted to teach or share with the new students coming into K1 and created a short video using Puppet Pals. I pieced all of these together into one movie. To all of the children and families I have worked with this year, thank you for all of your support. You have made this year absolutely fantastic! Good luck to all of you as you transition into K2! All about K1 from Pana Asavavatana on Vimeo. This whole inquiry began when I got a tweet from Duck Duck Moose, the makers of Draw and Tell. I had started using this app with the kids, but had only started using it not too long ago. I decided that emailing them would be a good idea, at the very least I was sure they may have more opportunities for me to learn how to better use their app in my classroom. Here's what they wrote to me after I told them telling them that I was indeed using Draw and Tell with the kids. When I told the kids about Duck Duck Moose contacting us and wanting to talk to us through a Google hangout they were over the moon! 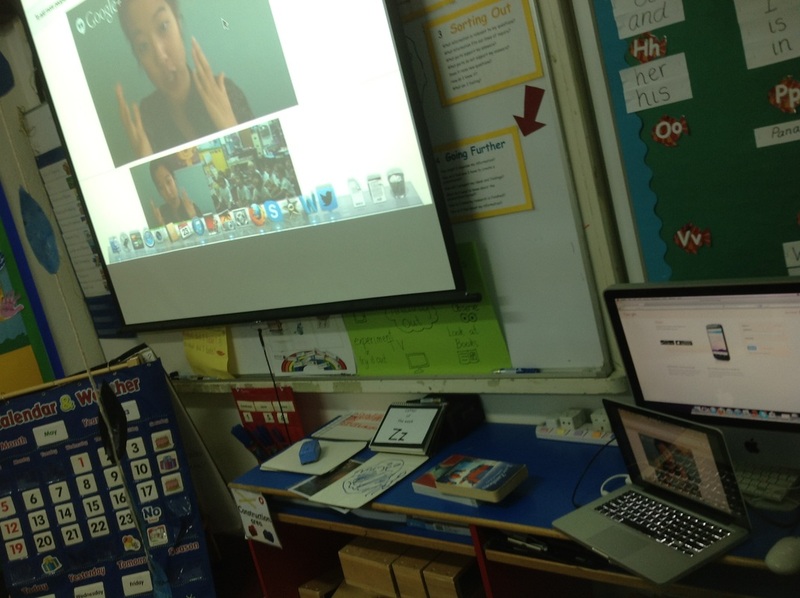 They had many questions about how Draw and Tell worked, and how it was made. Some children just wanted to tell the people at Duck Duck Moose how they felt about Draw and Tell. So I asked them how they wanted to send these questions and comments over. The kids said that we should use the app and record our voices! So that's exactly what they did! I compiled all of the questions and comments together on iMovie and uploaded it onto Vimeo so we could send a link over. Questions for Duck Duck Moose from Pana Asavavatana on Vimeo. Naturally, we wouldn't be good inquirers if we didn't make predictions first! I had the children do this more traditionally with pencil and paper. Predictions about Draw and Tell from Pana Asavavatana on Vimeo. Number stories on Draw and Tell from Pana Asavavatana on Vimeo. 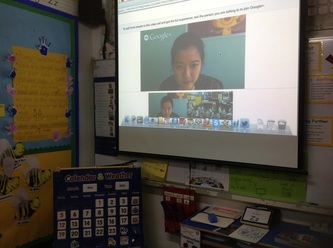 Phonics Review with Draw and Tell from Pana Asavavatana on Vimeo. Finally, on May 23rd 2013 we had our Google hangout and the kids were so excited to get to ask all of their questions! We learned a lot from Serena at Duck Duck Moose. Here are some of the things that we remember most from the chat. What we learned about Draw and Tell from Pana Asavavatana on Vimeo. Thank you Serena, Sara and Sarah from Duck Duck Moose! We had lots of fun learning from you! On May 17th 2013 we had our annual swimming gala! The kids really enjoyed playing the games they had been learning in swimming class and also just having a swimming celebration together! It was my first time to see the children swim and get in the water with them. I must say I had a lot of fun and I am sure everyone else did too! Thank you very much to our parent helpers Julene and Richard. I would not have been able to pull it off without you both! Make sure puppets stay on the stage so the audience can see them! At the end the children who presented with puppets used Puppet Pals on the iPad to document their stories. All the other groups were recorded on video. Here are their stories, enjoy! The Pirates and The Mouse from Pana Asavavatana on Vimeo. The Bad Dinosaur from Pana Asavavatana on Vimeo. The Kingdom from Pana Asavavatana on Vimeo. The Four Friends from Pana Asavavatana on Vimeo. Saving Bear from Pana Asavavatana on Vimeo. Three Little Men from Pana Asavavatana on Vimeo. The first way I used Popplet with the kids was to create a number line (ordering numbers) and practice some counting/one-to-one correspondence. It is that time of year for review, review and more review so any new ways I could find to practice number work, I used! 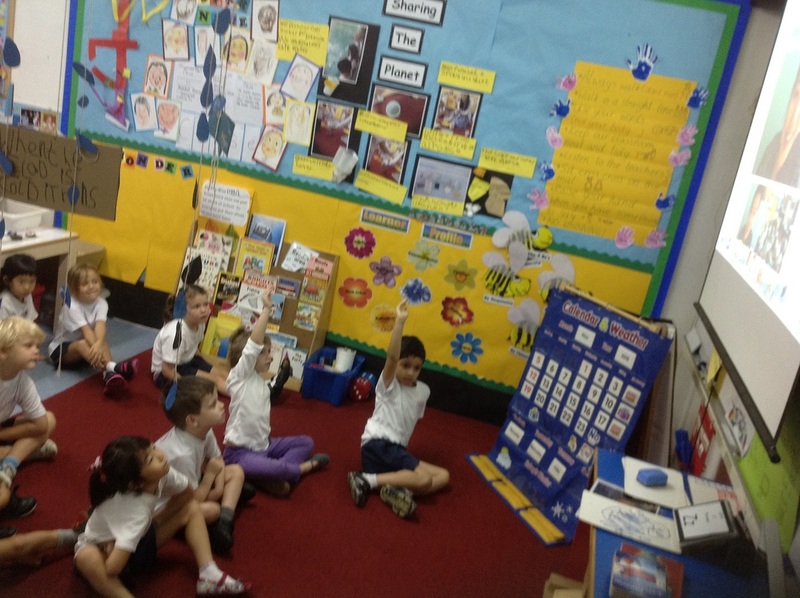 I differentiated by giving the children options with which number they could start their number line with. Some started with higher numbers, some started with smaller numbers. Either way, they were working within their learning abilities. I challenged some children to do their number lines backwards as well as an extension. I always get awesome ideas from the amazing teachers I follow on Twitter. In this particular instance, the idea was to have the children write a letter to the following year's teacher and tell him or her a little about themselves. Because writing an entire letter is a little too much writing for a K1 student (especially with the amount of things they want to tell their new teacher! ), I decided Popplet may be a good place to break down this information and have them write in short phrases as they are used to doing. I had them take pictures of themselves, things they were good at and/or things they enjoyed doing to create this mind map. Then they used the text feature to type in what each picture was about. I can easily see this as an activity to be used at the beginning of a school year as well, as a "getting to know you" sort of task. Parents can you see this app being useful at home or on holidays to document events or have your children observe something a little more closely? 1. The top bun: An initial introduction to characters, where they are and what they are doing. 3. The bottom bun: FIX THE PROBLEM! In three simple visual parts, the children were able to organize their stories from beginning to end without forgetting about characters along the way or using "and then..." repetitively, ultimately creating an almost never-ending story. Since we have published several books already using the standard pen to paper method, I though this time we'd use this particular piece of writing to explore an app called Little Bird Tales to create digital books. This app allows children to create books using a variety of drawing tools, photograph objects, voice record, and type in words. Teachers, if you create an online account, you can then upload these creations to your account and get codes to embed in blogs, print out PDF versions and share the link to the story by email to parents. In order to download a digital MP4 copy, they ask for a small fee of USD 0.99. Once emailed to the parents, they can opt to download their own copy to keep, or just view it online for as long as you still have the story in your account. Here are the stories from the three hamburger plans you see above. "What angle should we take the photo from?" "Where should the characters be to show what is happening?" "What position should they be in?" "Do you need extra props?" 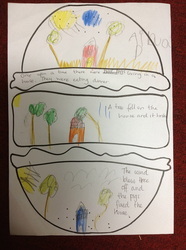 Once each page was set up using the Lego, the children snapped a photograph of the scene and then recorded the audio. here are some examples of their Lego stories! I typed in the text afterwards based on what the children were saying on each page to help readers decode the audio in case it wasn't clear. On a side note, I find it quite amusing how simply problems can be solved in a child's mind! Ah, the joys of innocence! It is that time of year when all the children are becoming aware of their impending move up to the next grade level. They are restless, tired, and basically bouncing off the walls! It also is that time when teachers use the threat "Uh oh, I don't think I can send you up to grade ______ if you keep behaving like that!" a little too often. It seems almost every teacher's dilemma is how to keep the kids focused enough to finish what needs to be finished before we run out of time! This was my big question too, so I decided to take a little inspiration from my fiance who is a strong believer in the power of meditation. Of course, I wasn't trying to get the children to reach some sort of transcendental spiritual state! However, in an effort to simply calm the children down at certain parts of the day, I thought I'd start doing what I call "relaxing and concentrating time". How can you relax when you are concentrating you may ask? Well, I told the kids, that when we do this 2 minutes of relaxing and concentrating, they will concentrate only on their breathing going in and going out of their bodies. I told them that it would be very hard to keep their eyes closed, not move and only think about their breathing, but that only made them more eager to accept my challenge! Do you think this is something you could use in your classroom or at home to calm down and return to a more focused mental state? 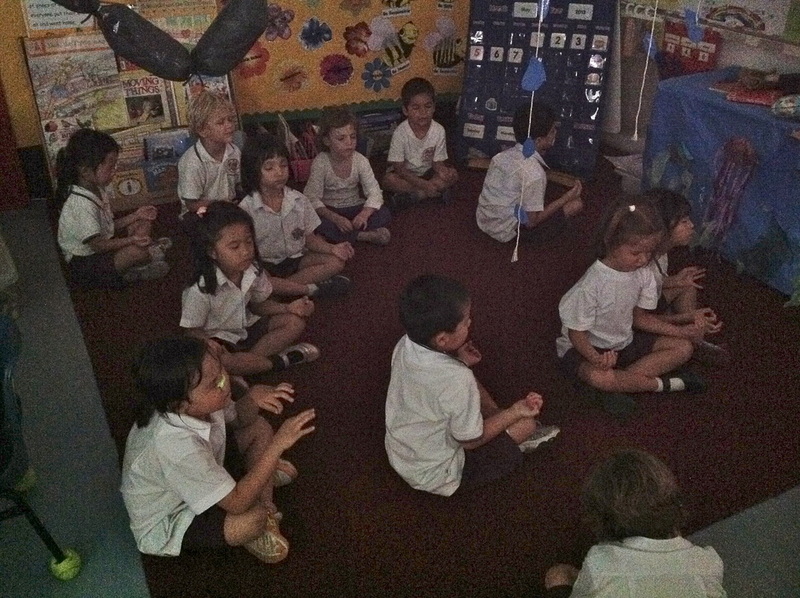 Kindergarten Movie Collaborations Across the Globe! 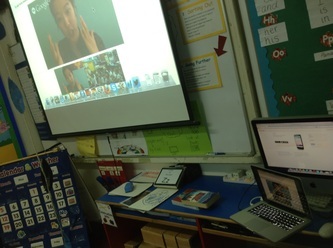 A little over a week ago I stumbled across a video that had been created by by a kindergarten class at Pasir Ridge International School in Indonesia! They sent it out into the cyber world without any audio hoping to reach a few other classes who may want to add it on. It just so happens our current unit of inquiry is about how "People have different ways of sharing stories" under the Transdisciplinary Theme "How We Express Ourselves". So I jumped at the chance for us to be involved in a project that would help the children think and learn more about the concept of 'perspective'. I showed the video to the children and they could not wait to get started! We spent a lot of time analyzing the video before we even got to looking at the plot. 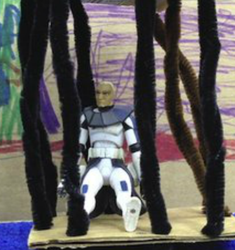 Escape from the Dark Side: Part 1 from ben sheridan on Vimeo. 1. First, we decided we had to figure out WHO was in the story, so we watched it one time round and counted the characters. Some of us counted four and some of us counted five. We watched it again and realized that one of the characters wore a hat in the beginning and took it off later in the movie. 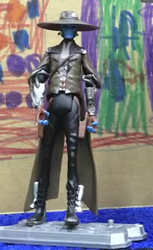 We verified it was the same character by looking for details that could identify him, namely, his skin was blue! The conclusion was that there were FOUR CHARACTERS. 3. Then, we decided to begin the story by thinking about why Hoowee was trapped in the first place! After some deliberation, we decided that Hoowee was trying to decorate Bad Cape Man and Bad Hat Man's house by scribbling on the walls (I love that they saw that detail of the background and used it in the plot!). Bad Hat Man got very angry at Hoowee for doing this and locked him up! 4. Two or three at a time the children came over to the computer and looked at a portion of the movie. They decided what the characters might be saying at that time, how they felt, what their voices may sound like and what sound effects may be necessary. We were pretty low tech with our sound effects but the ideas were totally student driven. Besides, aren't little kids the best at making awesome zooming, slashing, swishing or stomping noises anyway??? Here is K1PA's version! We are really looking forward to hearing the original audio as well as other versions that are being created by other classes around the world! Escape from the Dark Side from Pana Asavavatana on Vimeo. Special thanks to Ben Sheridan, the teacher behind the original idea! Check out how the original stop motion movie was made with his students and other awesome work HERE! Hi Everyone! 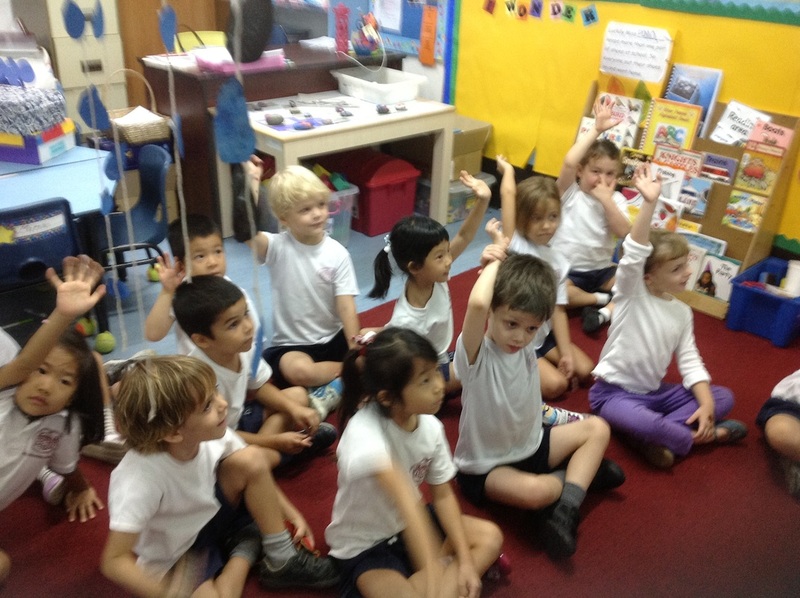 My name is Pana and I teach K1 at ISS International School in Singapore. I hope you enjoy following my class this year, and all the fun things we will be doing!